Recipe for a Successful Hunt - the4pointer.com | Real Hunts. Unreal Stories. I decided that I would write about the first ten successful hunts (in this case that means killing a deer) that came to mind and then pull out the key elements to the hunt that made it a success. I would then compare those to my initial recipe to see if it holds up to the test. So I grabbed the little white board at home and quickly wrote down the first ten hunts that came to mind in order to keep the test as true as possible. My wife loves it when I write stuff like this on the white board. She walks in the door, see’s the board on the counter with writing all over it and undoubtedly thinks to herself, “Aw, Tim wrote me a nice note to show his appreciation for me.” Nope, it’s just a list of deer kills. As an aside, inadvertently tricking your wife by writing on the white board is not helpful or useful in anyway; another theory I have tested over and over and proven to be fact. As I write I realize there is a drawback to my testing method. Hunting stories, although based on fact, are rarely true which doesn’t give me solid data points to use to test my theory. However, since everyone knows this I will move ahead under the understanding that what I am writing about doesn’t really matter anyway so who cares. Here are the first ten deer kills written about as “objectively” as possible in the order they came to my mind. 1. 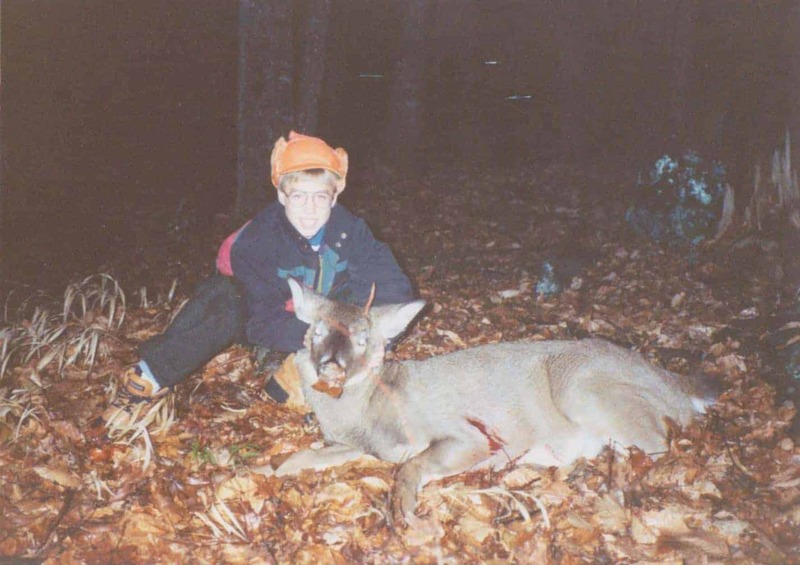 My First Deer – This was an amazing night. It was one of those rainy, foggy and warm Sunday afternoons in the Vermont deer woods when legends are written. I was 10 years old at the time and dressed like it was 40 below. No one had taken the time to tell me that you could dress appropriately for the weather so I was wearing my green woolies over my jeans along with 17 sweatshirts. I followed my dad, a mighty hunter who had already hammered ole one spike on opening day, which was the day before. He knew how to hunt deer so I paid attention to everything he did. Then I fell asleep in the blind because I was dressed for 40 below and it was 50 degrees. Good thing he was paying attention, though, because he woke me up just in time to see a hot doe trot by the stand. Dad knew this was a good thing so he told me to get ready for the big one that would be right behind her. I readied myself on the stump and sure enough the big one came trotting in. Incredible as he was I couldn’t make out any antlers. Dad said he could so I shot and missed and the deer ran up the hill and out of sight. Dad informed I had missed but all of the sudden the deer came running back (probably because he saw another hunter just over the hill) and stopped 10 yards in front of me. I shot again and nailed him. Instant legend. 2. 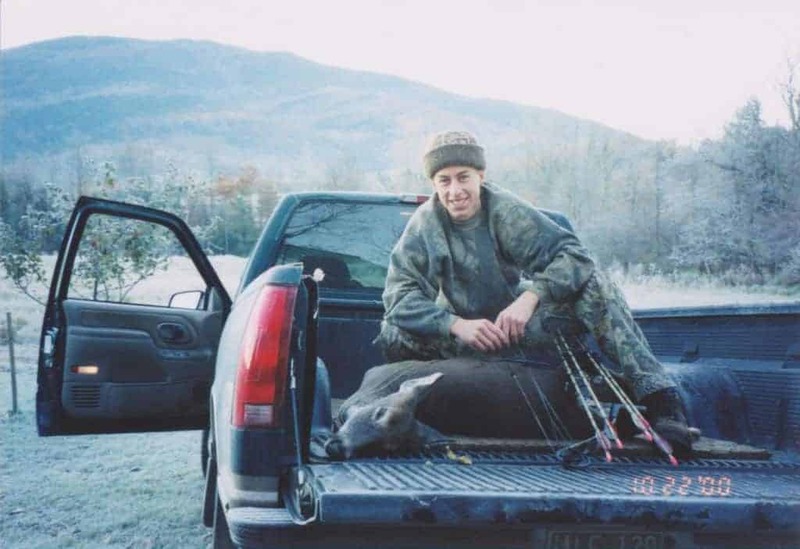 Archery doe – Back in 2008 I was hunting with my bow during the Vermont Archery season. I had scouted this place out quite a bit and although there weren’t many deer in the area I knew that some big ones were hanging around. In fact, two weeks before the season opened I sat in my tree stand hoping a bear would come out and a nice heavy seven pointer came out instead. He stood fifteen yards from me and ate an apple until dark. It was torture but I had a video camera so I got some nice footage of him to prove my story. Needless to say my hopes were high when I climbed into my stand on that fateful Saturday night. To my surprise, three does appeared in the field about 100 yards away. After thirty minutes they suddenly ran right for me and the biggest one gave me a nice shot at seven yards. I took it and she died. We also got a trail camera photo that very night of the seven pointer standing over the bloody arrow that had passed through the doe only hours earlier. The 7 pt came out later that night. That arrow marks where the doe was standing when I hit her. 3. 2 Minute Doe – The College I attended had a week long break in October. Most college kids headed somewhere to party but I took the opportunity to head to the woods. Since I was a long way from home, this week long break was my only chance to hunt other than over Thanksgiving. I had put in a solid week of hunting but had come up empty. On my last available morning to hunt I made my way through the deer funnel (the two story colonial on the left and the log cabin on the right) and climbed into my stand. I positioned my climber how I wanted it and hauled my bow up to hang it on the limb. I always think safety first so after I got everything else taken care of I tied myself off to the tree… I turned around to sit down and there was a deer standing underneath my stand. In all the hustle and bustle of getting settled I hadn’t heard or seen this deer walk in. The excitement of the last morning’s hunt combined with the gray light of dawn led to this fawns demise. In retrospect, I probably should have let the little thing go but it all happened so fast that I forgot to stop and think. It was no wall-hanger, or an adult for that matter, but the drag was easy and the meat was very tender. It was also about this stage in my career that I decided I should maybe let the little ones walk. 4. 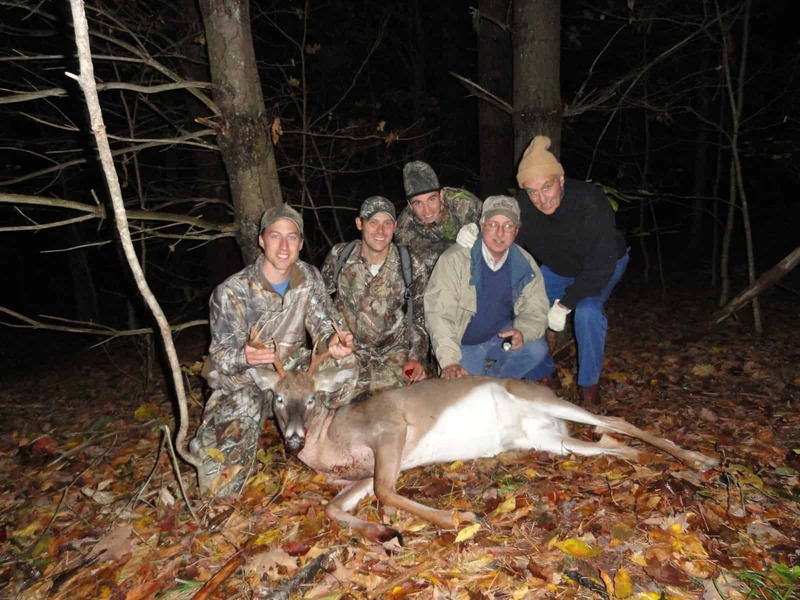 NH 8 PT – This was a fun deer because my brother in law was visiting from Tennessee and my Grandfather from Florida was up also visiting. My brother in law is not a hunter but he decided he would sit out in the woods with us anyway. My grandfather hunted these particular woods all the time when he was younger but had since given up the actual hunt and resigned himself to just telling his deer stories which make you feel like you are hunting with him anyway. My other brother-in-law, Josh, was hunting as well as Jared, the one who doesn’t hunt, and the three of us were spread out in various stands. About 30 minutes before dark a young 8 pt buck walked in and I shot him. It was a good hit but the three of us convened back at the truck before going to find him. This gave my dad time to get there to help and to pick up my grandfather on the way. We all found the deer together and it made for a great family memory. 5. Muzzleloader doe – I should be more descriptive when I make lists. I am not sure what Muzzleloader doe I was thinking about when I wrote that down. So In conclusion, I killed a female deer with a muzzleloader. Another instant legend. 6. 2nd deer – Having solidified my reputation at school as a big buck killer I was now on a mission to kill my second and bigger deer. It was another sunny Sunday afternoon and my dressing tactics had not changed since I killed my first deer. It was 50 degrees and I was dressed for very cold weather. My dad, the mighty hunter, had killed his deer on opening day which was the day before. This whole story is oddly similar to my first deer. Now that I was a couple years older and had my first deer under my belt my dad was not as quick to get off the couch on Sunday afternoon to take me out, especially since he had bagged the big one the day before. I convinced him to get up and we hiked to the top of a big ridge and snuggled in at the base of 3 trees that were well positioned in the hardwoods. That 50 degree sunny weather was beating down on me hard, and dressed like I was, I started to fade off into dream land. Suddenly, not 15 minutes after got there, a buck and a doe came wandering down the hill. Through my scope I could see two very defined spikes. This deer was twice as big as my first one! I took a slightly quartering-to shot and hit him in the shoulder. He started running down hill so I popped up out of my seat and ran to the edge of the rocky ledge and shot again hitting him in the lungs. 7. Half rack – This particular buck almost got away. It was the day after Thanksgiving and Dad and I were hunting in zero degree temperatures in three inches of fresh snow. Now that I had learned to dress for the occasion I had underdressed and was freezing. We were just about to head back to the truck to warm up and decided to give the grunt call a try first. To our amazement an aggressive buck came running over the hill looking for a fight. He was moving through the hardwoods when I shot the first time and I missed cleanly. At the shot he turned around and ran back up the hill where he had come from. Before he headed over the hill he stopped and looked back. His vitals were blocked but I had a shot at his neck and took it. He dropped in his tracks. 8. 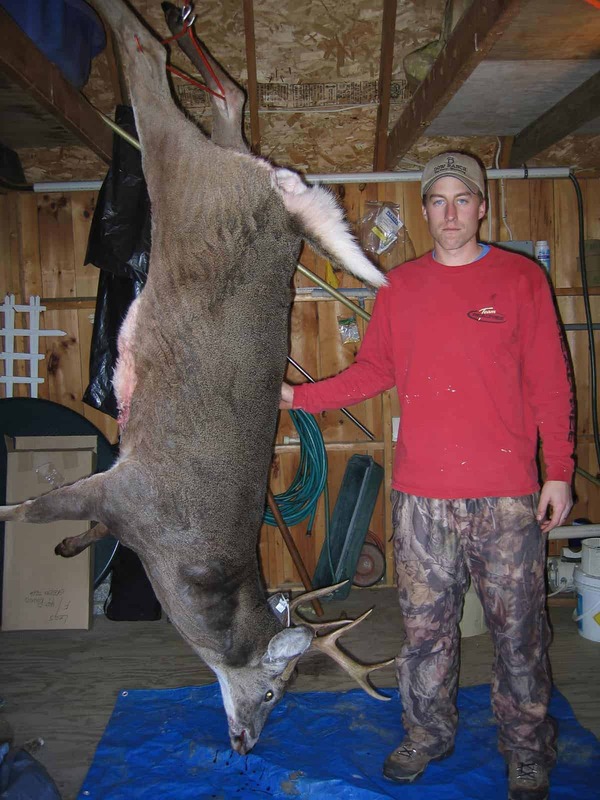 Big Fella – To date my largest Vermont buck is a 6 pt, 182 lb black footed swamp buck that I didn’t shoot in a swamp… This story actually begins at the end of the previous hunting season when I forgot to bring my climber in for the offseason. Brilliant! So, I decided it would be in my best interest to go retrieve the stand on an early season scouting mission. Three weeks before the opener I found my stand and also discovered that the area was covered with deer sign. Rubs and droppings along with fresh acorns were reason enough to convince me to leave the stand right where it was. On opening morning I found my stand in the dark, climbed the tree and secured myself. I turned around and sat down and fell right through the seat! Leaving your climber in the woods for a year is not the best idea. But, thinking quickly on my feet I decided to raise the upper portion of the climber so that the railing was at chest height when I was standing up. Brilliant! Now I just had to stand all day. Around 7:30 I blew on my grunt call and heard a deer come walking in. I located the deer’s head and my adrenaline rushed when I saw how big he was. He stopped behind a thin hemlock about 60 yards downwind of me and I could tell he was getting antsy so I picked a spot through the hemlock branches and fired. He dropped straight down. I was thrilled! Then he got up. He ran across the hill in front of me and I put two more shots in his chest before he went down. I wasn’t about let a buck like that get away. All hunters who kill big deer take pictures with their “mean face”. Me too, only I’m not very good at it. 9. 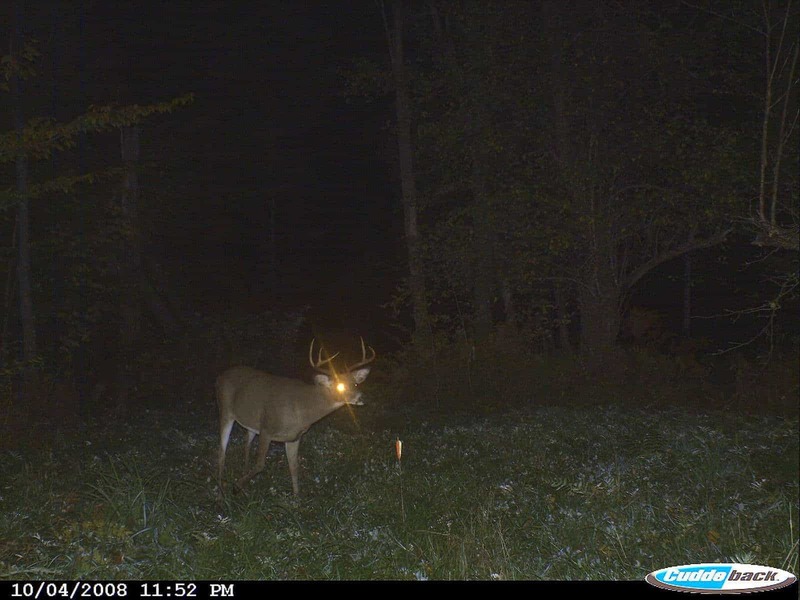 NH 4 pt – Last year I shot a four pointer on the way back to the truck. Although I was skillfully hunting my way back I was still a bit surprised to see him feeding at 10 am in the morning. I have long hoped that I would stumble across a giant buck stupidly following a doe during the middle of the day but in this story the giant buck turned out to be a four pointer. Having just checked my rifle the previous week I was a bit surprise at how many shots it took me to anchor the monster but the big ones always go down tough. 10. Hind Leg Doe – She’s called the hind leg doe for a reason and it’s because I hit her in the hind leg with an arrow. Call it lack of skill or lack of experience if you will, but I hadn’t given myself enough clearance from my climbing stand when I shot and my bow limb hit the stand when I released throwing my arrow off line. It was a sickening feeling to watch that doe run away with an arrow stuck in her hip and I wasn’t very confident we were going to find her. We quietly followed the sparse blood trail and we eventually jumped her up after dark. We heard her trot off and called it a night. Unbelievably, Dad noticed a pool of fresh blood as we were walking out of the woods. We were 200 yards from where we last heard her and in a different direction that we thought she had run. We shut off the flashlights and listened to see if we could hear her. Sure enough she was walking on the hillside above us. The next morning we returned to that same spot and found her in five minutes. The arrow had sliced through an artery and she had bled out. I felt bad that she had taken so long to die but at the same time I was a little perturbed that we found her so quickly given that it was a school day. I only got to miss the first period. It’s obvious that a recipe for a successful hunt is something that is created over time. Making a recipe from scratch takes patience and practice just like killing a deer. But when I look back through the stories I think it’s safe to say that my initial ingredients are correct (minus a few spices) but the amounts for each were not. Skill and time are clearly important factors to killing any deer but I can’t help but notice the amount of times I benefited from the third ingredient so I’ve updated my recipe to reflect the change. Recipe cards will be available for download at a future date. 10 cups of dumb luck!